Discussion in 'Oil and Lube Systems' started by Loves302Chevy, May 21, 2016. Hey Grumpy, have you seen this yet? 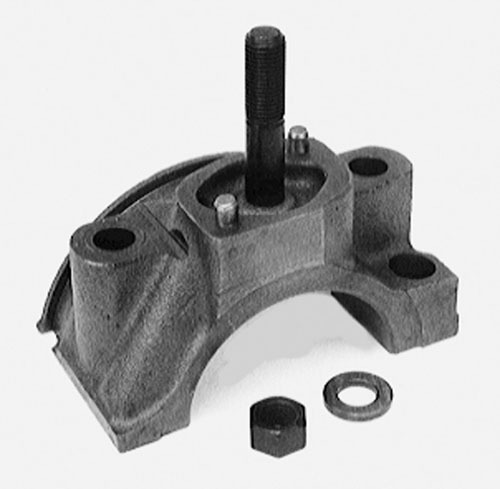 This design is significantly smoother through the use of new helical asymmetrical gears. The new gear design provides the engine with an improved flow of oil without the usual pulsing found in traditional gear pumps. Significant reduction in pressure ripple (pulsing). 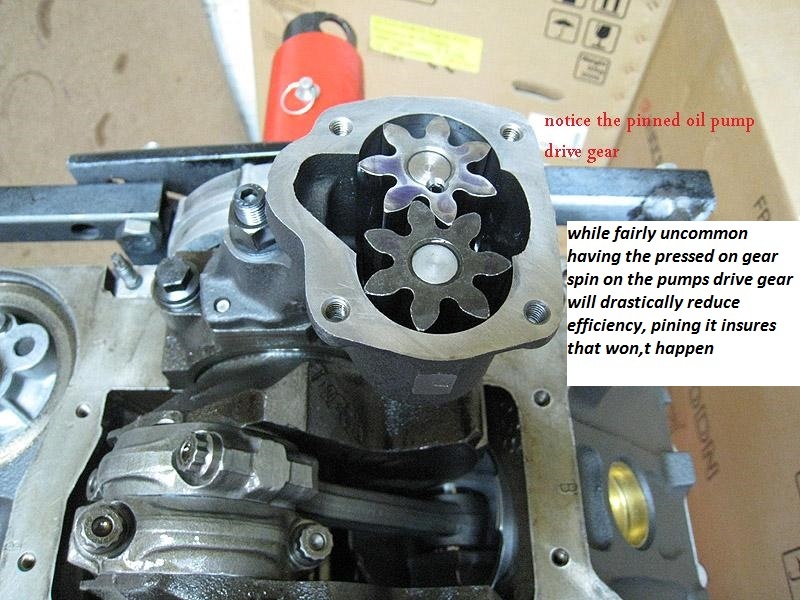 Reduction in torque ripple in the pump drive. Improved distributor operation - reduction in spark scatter. Improved distributor gear and intermediate shaft wear. Includes chrome moly intermediate shaft with steel guide. Its a Recap idea that Pontiac Motors used all thier V8 engines 1955-1959. 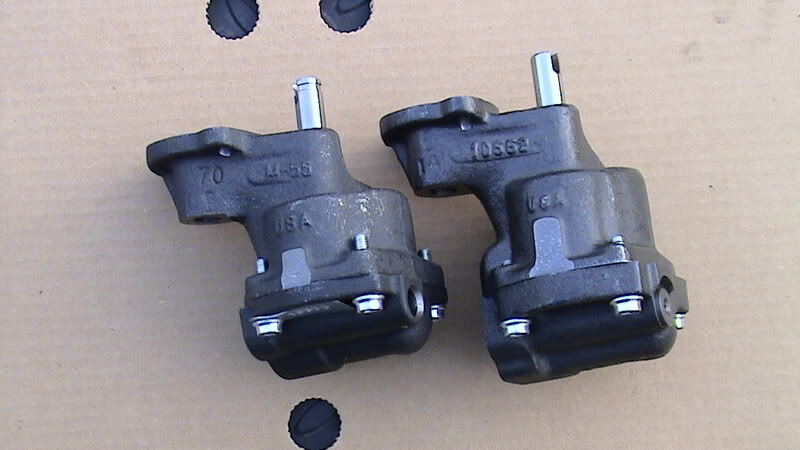 Pontiac 287, 316, 347, 370, & 1st year 389...all had Helical cut oil pump gears stock. Peformance years / Max Pontiac Main Mod tore down his 1959 389 V8 & took pictures for us Pontiac Guys. Those OLD engine designers had it right! This is one of those, DUH - Why didn't I think of that, ideas. Early Pontiac engines were reverse cooled too, sometimes things that look/appear better are not. and yes the design will reduce a tendency to produce a pressure pulse, I have not seen this as a major issue. 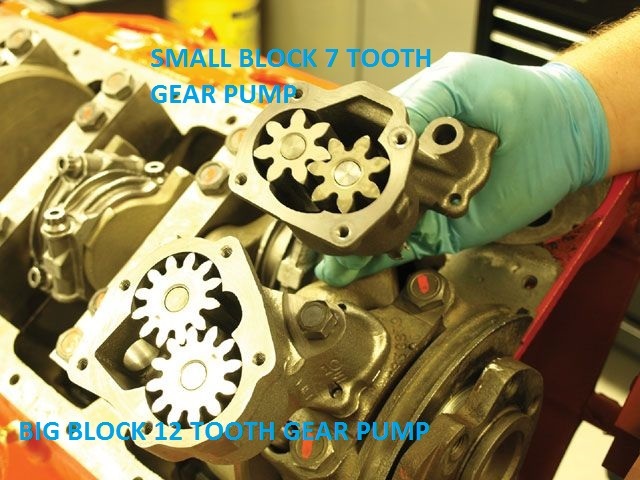 simply swapping to the standard volume and pressure BIG BLOCK 12 tooth oil pump in a SBC engine all but eliminates the pulse and pressure and volume issues a sbc oil pump has. 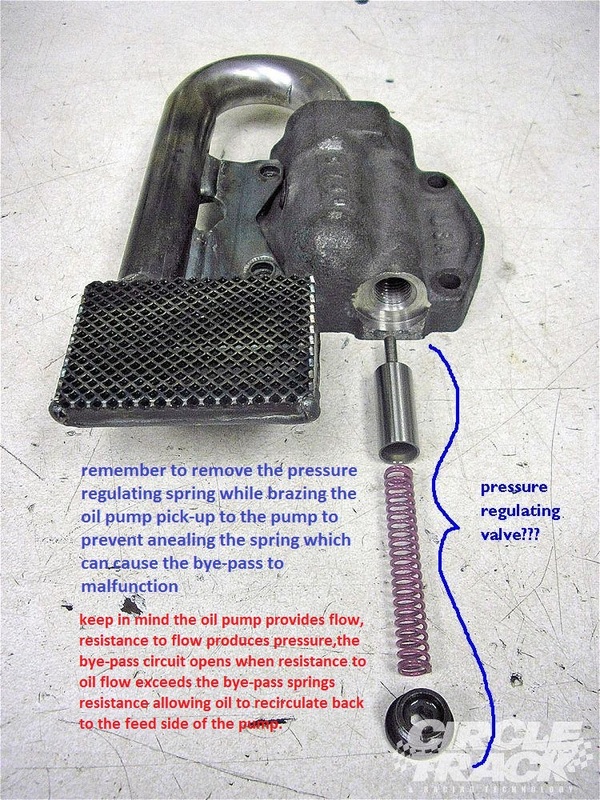 keep in mind fluids like oil, are not compressible the resistance to flow increases as the pump is turned simply because the oil flow exiting the oil pump is flowing through the bearing clearances thus the oil flow exiting the oil pump is being restricted, if the engine was rotating the restriction too oil flow is reduced. 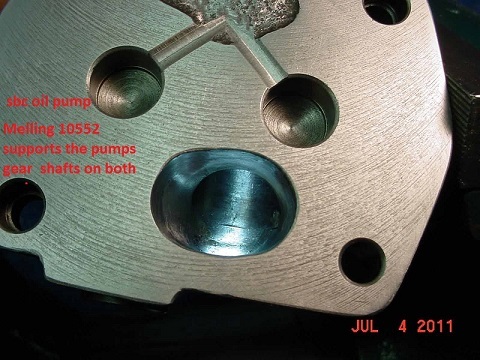 if the oil pumps pressure relief valve opens as designed max resistance is limited to the pump producing flow rates that will build until resistance to that flow volume reaches about 60 psi, when the pressure relief valve opens re-ce-recirculating additional oil flow back to the low pressure side of the oil pump.remember volume increases as rpms increase up to the point where the relief valve opens limiting pump flow. I agree. And I would do that before I spent $150. for that ST oil pump. So here I am with my fully rebuilt '69 LM1 which by the way is running fantastic. Smooth as silk, engine is steady as a rock at idle, and you can feel the power even though I haven't jumped on it (because I'm still breaking it in). I got to this point because of a lot of solid advise from folks on here...thank you. Especially Grumpyvette who gave a lot of good and well thought out advice. So after all that, there's one thing bugging me. The oil pump seems to be "noisy". Now Grumpy if you're reading this know I've already been to your forum and read the links on pump noise and that it shouldn't really have any, causes etc. So let me first qualify "noise". As the engine runs, you can here a whirling almost like a belt driven accessory or gear whine but its quiet enough that you'd never notice if you weren't looking for things (new engine, after all). Using a stethoscope I confirmed it is loudest at the sump end of the pan. The stethoscope defined it better to be a little more of a sound you would expect from two gears meshing. Once the engine is at operating temp it becomes undetectable to the ear. I feel like I've done everything right, but it feels wrong that I should be able to hear it at all with the engine running. Before the rebuild I never heard the oil pump. But then again that pump was 48 years old with 130K miles on it and God knows how clean the oil may or may not have been before I got it, or how much wear it may have had. 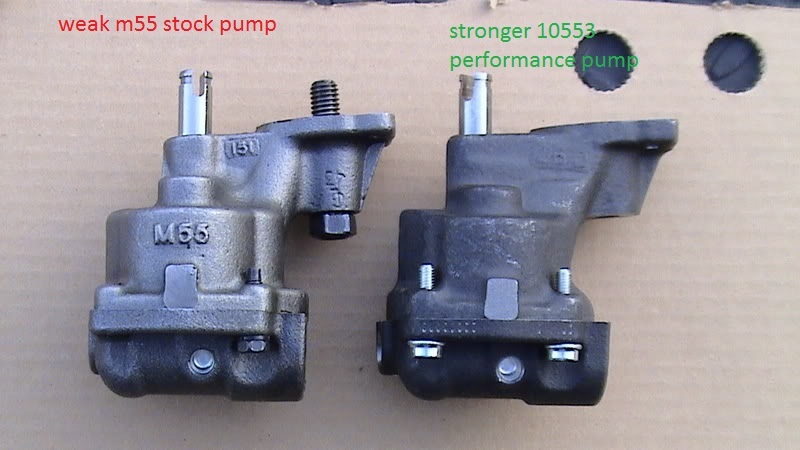 But the M155 is a higher flow pump (but not HV - those things are taller and need a different pan, and would be too much for my stock rebuild with stock bearing clearances) so maybe being new + higher flow, it makes more noise. Finally, I called Melling and they said "oh yeah, don't worry about it". But its the oil pump, and a new engine. Of course I'm going to worry. Its what I do best in the absence of sound facts. So tell me, am I being paranoid? 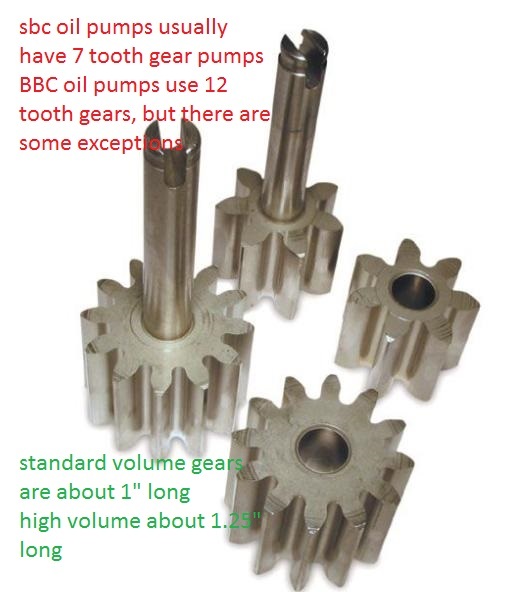 got too ask , why the fascination with the hectically cut oil pump gears? 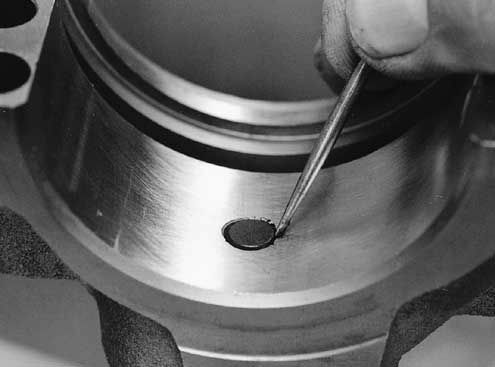 keep in mind fluids like oil, are not compressible the resistance to flow increases as the pump is turned simply because the oil flow exiting the oil pump is flowing through the bearing clearances thus the oil flow exiting the oil pump is being restricted, if the engine was rotating the restriction too oil flow is reduced. 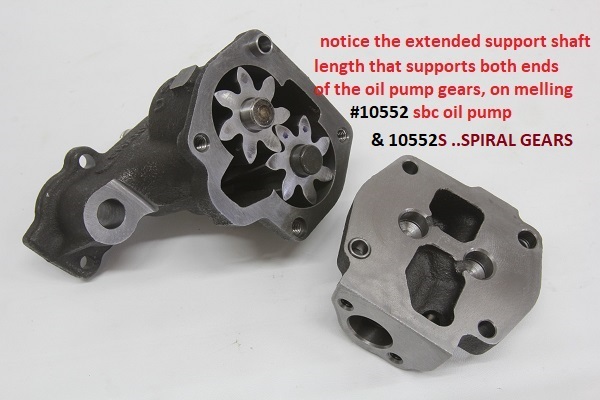 but keep in mind oil pumps spin at half the crank rpm, and as rpms increase so does the out put oil flow until the by-pass valve opens if the pressure builds up to the point it pushes open the by-pass valve. GRUMPY...I used a mic to measure the gears in the new pump, basically they had 0.0005" clearance to the bottom casting face. I used a piece of glass as a flat surface and sanded both gears until I acheived 0.002". I also use a file to break the top and bottom edges of the gears as they were very sharp. Installed the 58# pressure spring after tig welding the pickup on (yes I removed the check valve first before putting the heat on it!). Pressed the drive shaft on (what a nice fit by the way, it would take significant effort to pull this one off but the groove on the pump shaft is wider than the ridge in the driveshaft so there is still some axial play and the instructions with the shaft say that this is the desired outcome. Primed it and threw it in the motor. Now to bolting it on, one thing I noticed with the original oil pump, the M155 I replaced it with and now this one. When you put the pump onto the mount face on the rear main cap, the pump will rock slightly indicating that mounting face is higher in the middle than at the dowels. I'm talking probably 0.001" or less. I don't really like that, but both the original pump and the M155 have witness marks showing full contact to the face all around when torqued. So I put this one on and torqued to 65ft-lbs. 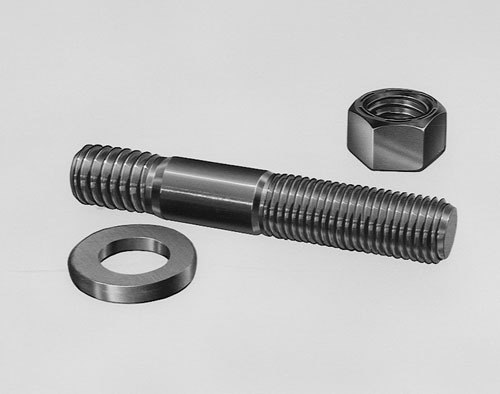 One note, Grumpy's site talks about being careful not to have the bolt put pressue on the back side of the bearing. My main cap is blind-drilled (not through hole) and the bolt length is less than the depth of the pump+threaded hole depth so even with bolt stretch it won't bottom out. At least that's one thing I can rule out here when trying to understand what the noise was. BTW - I followed the GM instruction on pulling the pan without pulling the motor. They missed a couple of important notes, such as 1) if your car has A/C, you need to remove the compressor and lay it aside because the A/C hoses don't have enough movement to allow the lift. 2) They recomment unbolting the rad and letting it hang there so it will lift with the motor. Bad idea, it will put strain on the hoses, transmission lines, hose clamps etc. It will also cause the fan blades to bear a lot of the weight of the full rad as the fan shroud bears on the blades. I got my engine hoist and used some wire to "hang" the rad on the hoist boom and lifted it with the motor so all the connections remained on the same plane. 3) The book says to use 4" blocks of wood under the engine mounts. I used 2x4's. A 2x4 is actually 3.5". Turns out that's enough to make it not work. The book says 4" and it has to be 4" and with that, you'll have about 1/4" clearance to get the pan down but only after you disconnect the idler arm from the chassis and let that whole linkage hang. Well, it's all back together and when drill-priming I immediately noticed a difference, so much quieter. After that, running it at various speeds and loads, both with warmed up oil and cold, failed to produce the noise originally complained about in any way shape or form. I'll pronounce the issue resolved with the root cause being either the pump drive or the pump itself. Curiousity will cause me to evaluate those components deeper "on the bench" for future reference. Thanks everyone who commented for the tips! I was told in the past not to use a Big Block Chevy Oil pump on a 010 Factory Block with factory main caps. 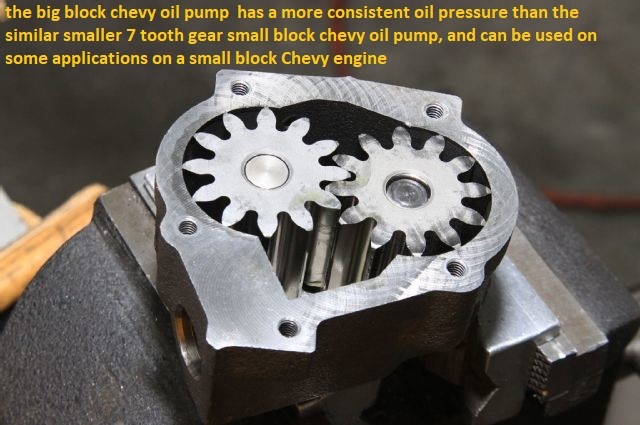 The Big Block oil pump is heavier. 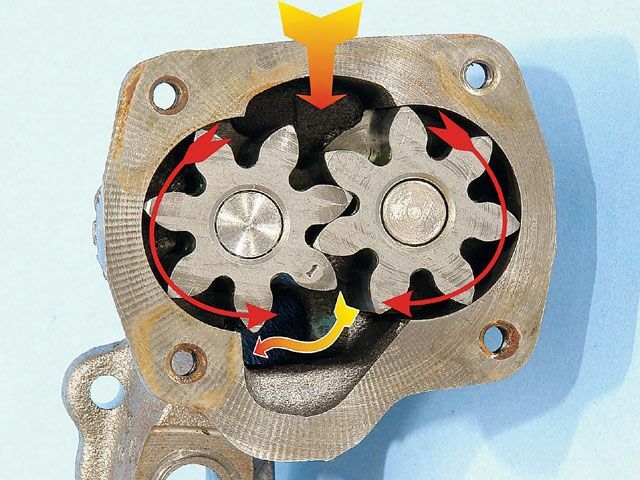 Rough dirt tracks caused the #5 maincap oil pump boss to break off. Back in my dirt track engine buiding days. 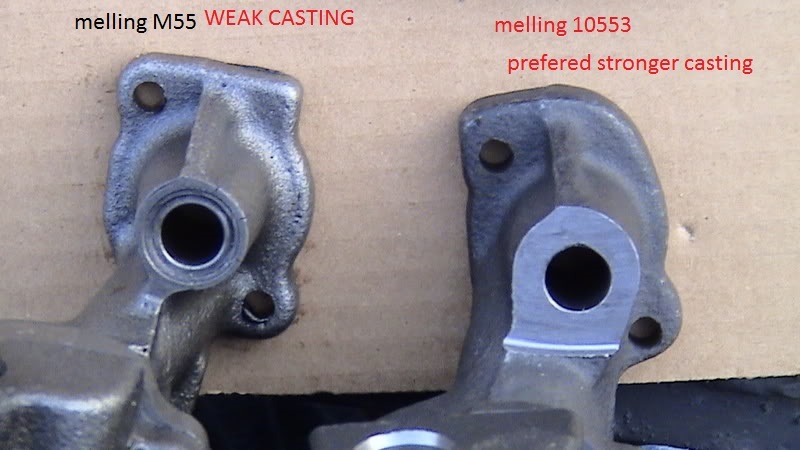 We used Melling High Volume pumps SBC. which directly transfers that force to the drive gear inside the pump, forcing it into the cover. Good way to ruin a new oil pump. That could have contributed to the noise that the OP was hearing.